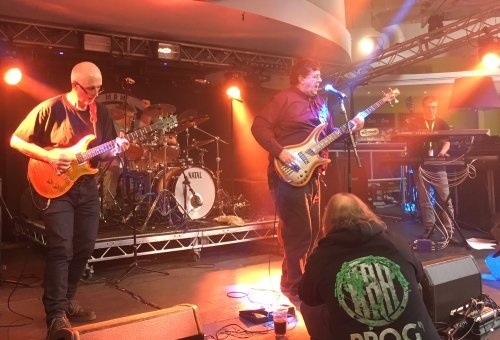 HRH Prog 6 put on display an impressive range of bands old and new in the now familiar yet remotely beautiful North Wales location. 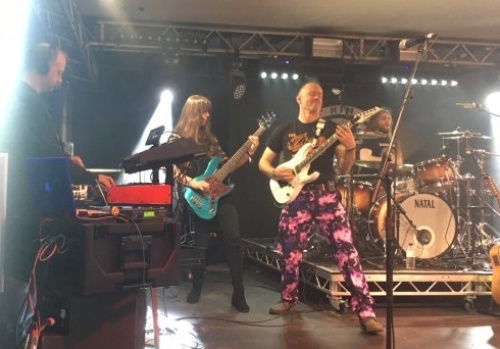 Following on only a few months after HRH Prog 5 in March, it now appears that the long term plan is for event to run annually in November, making Autumn/early Winter a busy period for Prog fans, with the regular Summer’s End, Danfest and Masquerade events, all of which have their own distinctive flavour. The HRH organisers now seem to have hit on a proven formula of presenting Progressive and more mainstream ‘name’ rock bands of older heritage across two very different arenas. 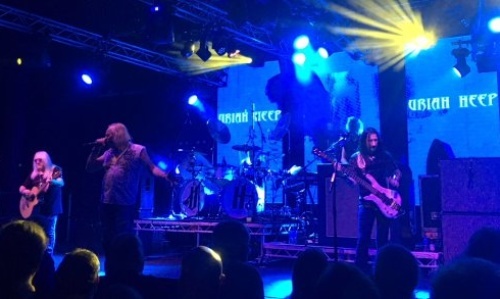 Indeed, although Arena One is very large by modern Prog standards, usually packing hundreds of punters, Arena Two is much smaller and features mostly younger, lesser known or cult bands playing to perhaps a more receptive audience, apparently willing to venture beyond the largely nostalgic roster in the main venue. 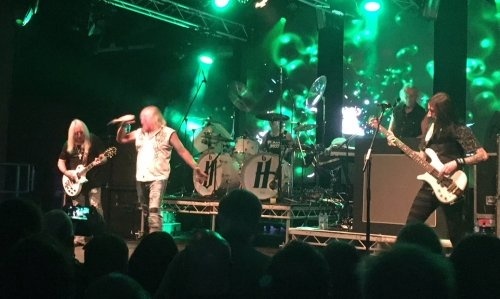 The stage in Arena One is massive with impressive lighting and back projection screens, the auditorium mainly featuring the ‘name’ bands of the ’70s who cater for the great majority of the crowd who want to see the older legendary bands. Of course, there are some who interchange constantly between the arenas according to whim and taste, but there is a sense that many fans claim a table and chairs in Arena One early on and clamp on like limpets all day, although this may be understandable for some older fans or for those with mobility issues. This arrangement works well in terms of accommodating the bands, but it does seem to have developed into two different festivals on one site with many fans never leaving Arena One to experience artists beyond their familiar ‘comfort zone’, whilst perhaps more open minded or hardened modern day ‘proggers’ seem to gravitate to Arena Two, which tends to be less packed and easier to buy a beer… even if the bands are competing for attention in an area shared with some shops and eateries. 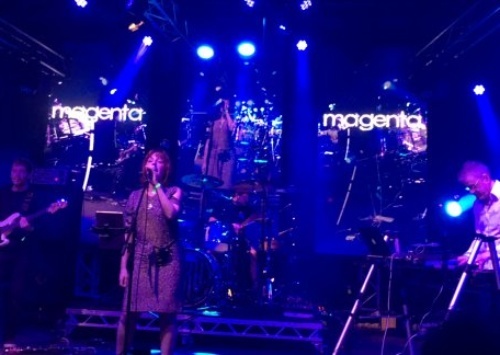 The other factor which adds to the sense of two competing festivals is the rather frustrating tendency to schedule bands on the two different stages at exactly the same time, creating almost impossible choices at times (for example, I agonised over a choice between two favourite but very different bands in The Fierce and the Dead and Magenta). 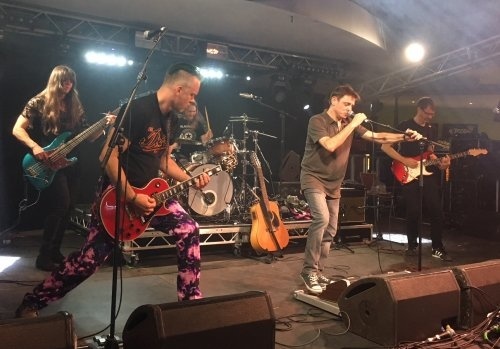 Perhaps the organisers could consider more ‘staggered’ stage timings so that fans who wish to can experience as many bands as possible. The Progressive Aspect had intended to try and cover both stages, but alas a ‘bug’ halved the TPA contingent present so I tried to cover as much as possible myself, meaning that quite a few sets were only partially seen – not a reflection on the artists, more a conflict of times and a keenness to cover a wide range. 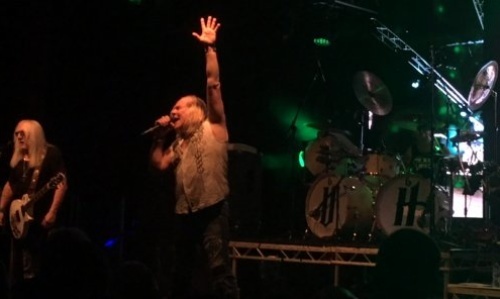 TPA also has to confess that the first evening of the event was missed by this reviewer due to having second row seats to see Robert Plant elsewhere which was, with no disrespect to the Thursday line up, no contest in terms of choices. 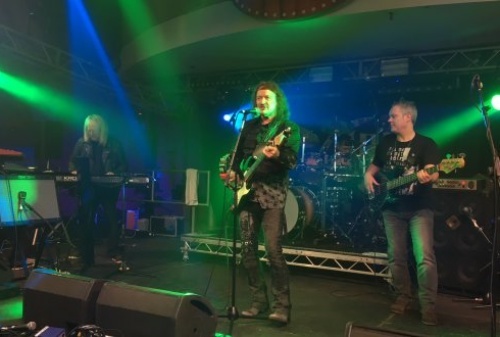 The glories of the never ending roadworks and seemingly infinite traffic jams around Birmingham also put paid to the first part of the Friday line up, which was a pity as I particularly wanted to see Kyros (whom I hear went down very well). 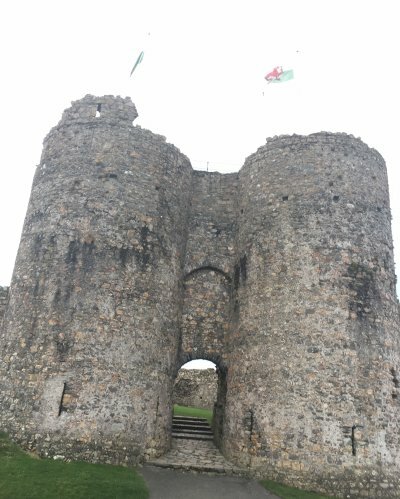 Beautiful as this North Wales venue undoubtedly is, the one massive drawback is that somehow it manages to be almost universally inaccessible to the rest of the U.K. without Herculean road trips! 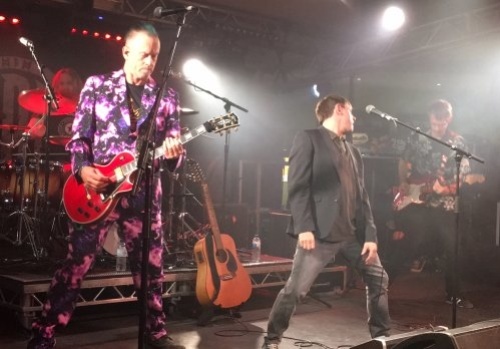 As TPA published ‘on the spot’ reports on Facebook for most of the acts seen at the time of the festival, this article will be more of an overview of the bands, rather than more lengthy reviews, most of which are available on the TPA Discussion Group page. 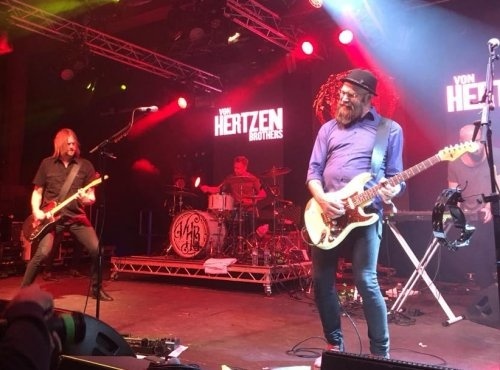 This young Welsh rock band, featuring Dan Nelson of Magenta on bass, produced a promising and powerfully heavy set in Arena Two. 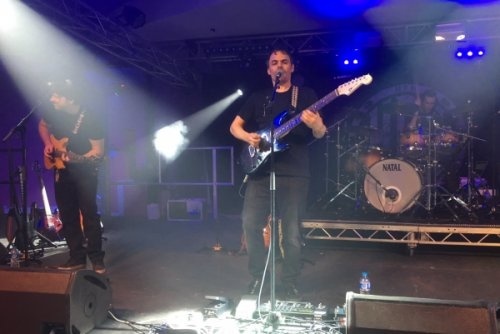 Darran Charles (who also plays with The Pineapple Thief) was particularly impressive on guitar, alongside the rock solid Dan on bass. 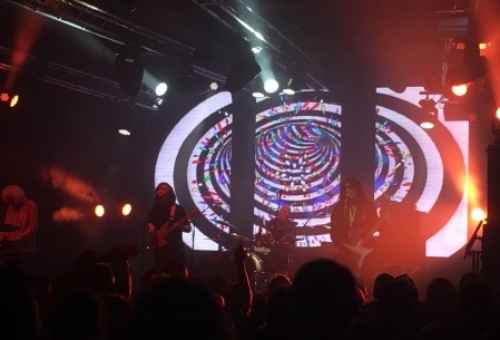 Over in Arena One this offshoot of Hawkwind performed an impressive stoner rock show with psychedelic back drop to a packed audience, bringing back memories of Hawkwind’s brain melting show last year. 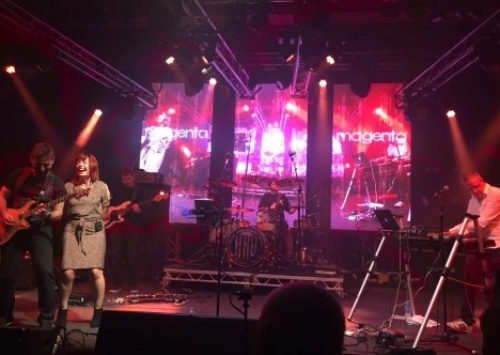 The evergreen Canterbury Proggers enchanted Arena One with a beguiling set of melody and Progressive Rock. 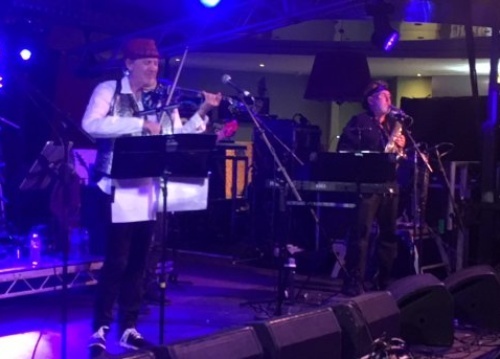 Multi-instrumentalist Geoffrey Richardson, who must be approaching ‘National Treasure’ status, switches with ease from guitar to violin and flute. 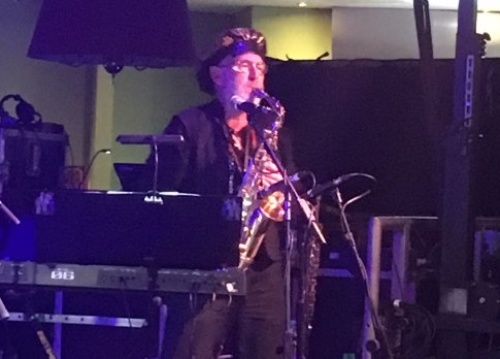 He reminds the crowd that 2018 is their 50th anniversary and there are no signs of them flagging, especially Pye Hastings. They close the set wonderfully with the epic classic Nine Feet Underground. 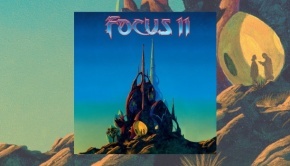 Scintillating melodic heavy rock from Finland’s greatest export since Lasse Viren. War is Over opens and it’s epic in sound and theme. 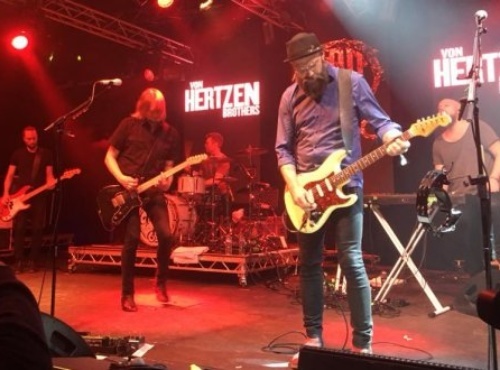 New single The Arsonist is a finely honed and hook filled heavy rock song, Kie Von Hertzen’s guitar work is as impressive as his gargantuan but finely groomed beard! Kiss A Wish from their 2005 second album affirms their Prog credentials with atmospheric and expansive Floydian keys. 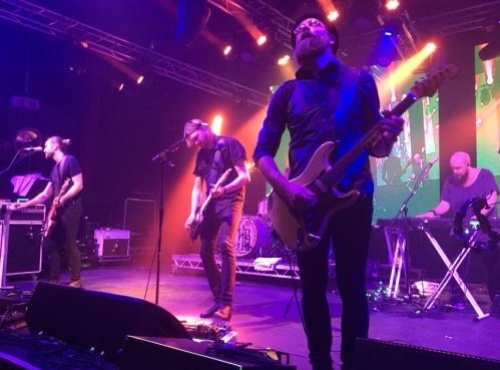 Frozen Butterflies from the new album is requested so they play it and it’s very impressive. 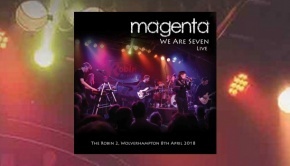 Despite many being unfamiliar with the material, in a packed auditorium such is the quality of their exciting set with an effortlessly cool charisma (particularly vocalist Mikko Von Hertzen) and all round outstanding musicianship that they have the crowd eating out of their hand, singing along loudly. 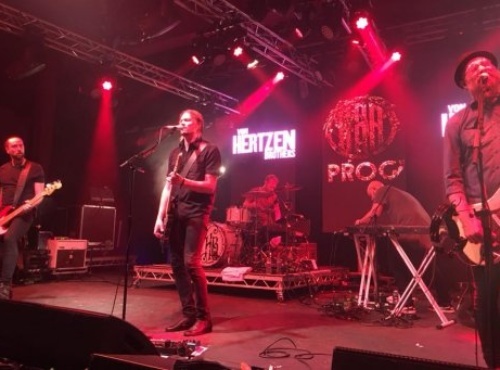 A very entertaining set which undoubtedly claimed many new fans, this is clearly a skilled and versatile band equally at home at the previous weekend’s Hard Rock Hell as they are at HRH Prog. WOW! 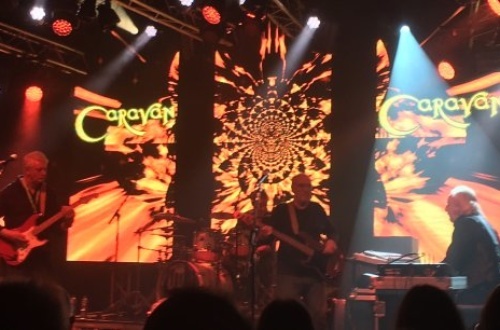 Meanwhile from Planet Bonkers we had not one but two PROG LEGENDS in Arena Two as David Cross from King Crimson and David Jackson of Van der Graf Generator (and now Kaprekar’s Constant) combined in a fabulous and at times bizarre set. Material from the David Cross Band album The Sign of the Crow was fascinating, including a JFK quote in Starfall and some stellar work from Paul Clark on spectacular Flying Vee guitar (and dubious shorts!). 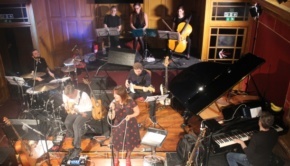 The combination of Cross’s electric violin and Jackson’s saxophone and flute was intoxicating and never predictable. 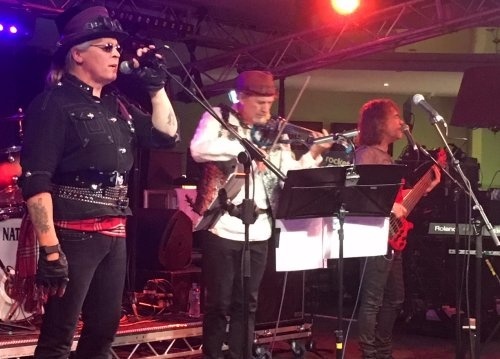 Amidst the musical mayhem they were also capable of beauty, such as the delicate tones of The Pool and the atmospheric charms of Exiles from Cross’s days with King Crimson. There was also great banter including Jackson being described as being from “Van Halen or Van Diesel”! 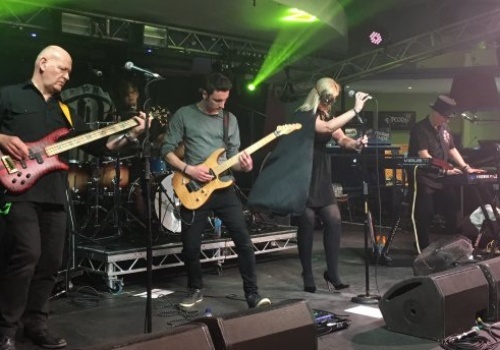 One highlight was a fantastic version of Theme One by Van der Graf Generator with added “La la las” from an audience nostalgically remembering the classic theme used for years as the theme to Tommy Vance’s Friday Rock Show on Radio 1. Word clearly got around about this fabulous show as Arena Two filled up, those that left the masses in Arena One being rewarded with an absolutely wonderful climax to the show as the David Cross Band delighted the crowd with an epic and mysterious Starless… and just to add to the King Crimson joys they encored with a brilliant version of the absolute all time classic 21st Century Schizoid Man. Stunning. I made the mistake of missing these guys last time – I’m SO glad I made the right choice tonight – outstanding and magical. Surprise of the weekend for me. 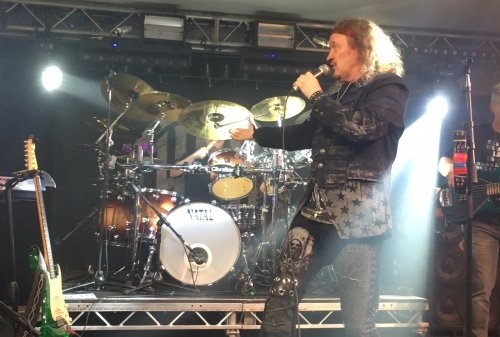 Quite ‘Eavy and not very ‘Umble, I only caught the end of this show and found a packed sweaty Arena One crowd enjoying the classic heavy rock of these veterans whilst I had been on ‘Planet Bonkers’ next door. 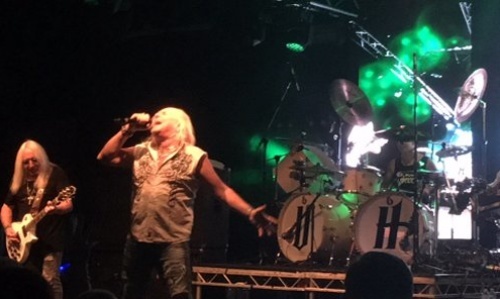 Uriah Heep showed impressive guitar and organ work, and I was glad to catch the finale of this classic rock band of the ’70s. Lady in Black from their proggiest album, Salisbury had the crowd singing along heartily. 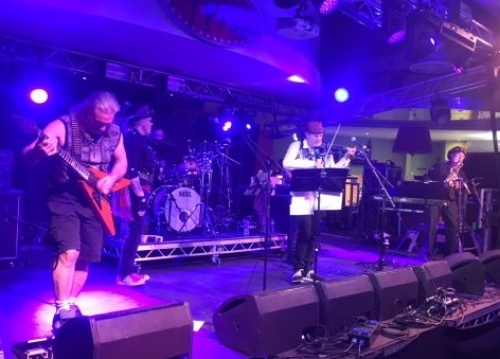 Easy living from 1972’s Demons and Wizards gave the enthusiastic crowd in Arena One a rousing end to the day. 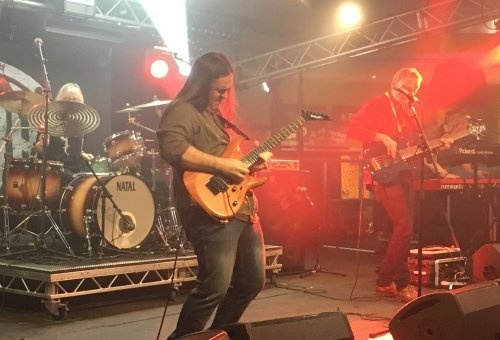 The last band of the Friday in Arena Two overwhelm an increasingly large crowd with a great set of relentless and captivating Progressive Metal. EVERYTHING about this band screamed ‘QUALITY’, with excellent drums from Johannes James and class keyboards from Richard West. 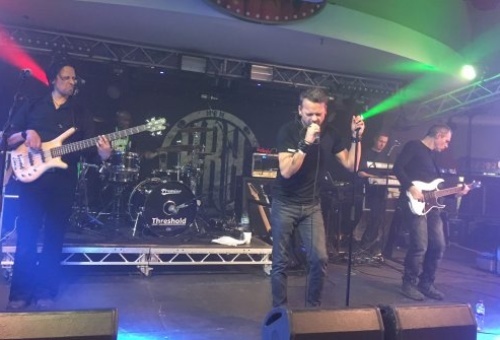 Threshold recently welcomed back the outstanding vocalist Glyn Morgan, who also played guitar. 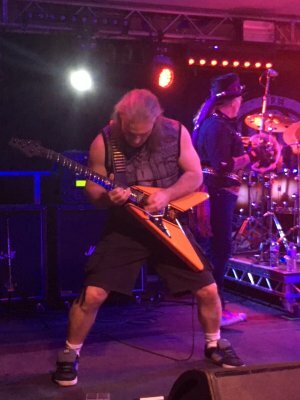 Most remarkable of all was the fantastic guitar work of Karl Groom. There was a touching reference to now deceased former vocalist Mac as they ran through some older songs. They declined a request to play Phenomenon but displayed PHENOMENAL power and skill in a great show. 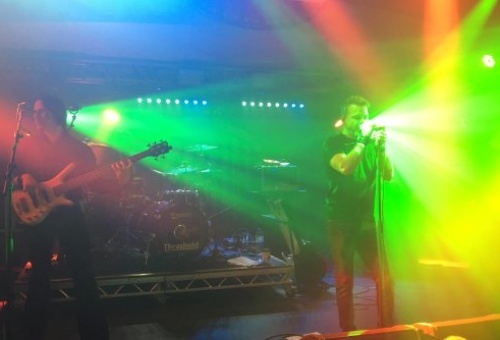 To be honest, I’m not too familiar with their stuff, but they eventually – and almost literally – battered me into submission and respect with their excellence (and volume?) 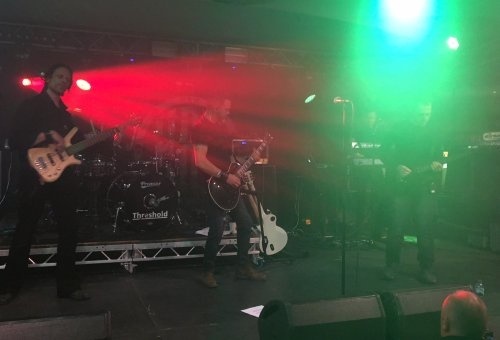 – to be fair, quite a feat for a band to induce this in someone who had driven for 7 hours and stood up for the rest of the day!! 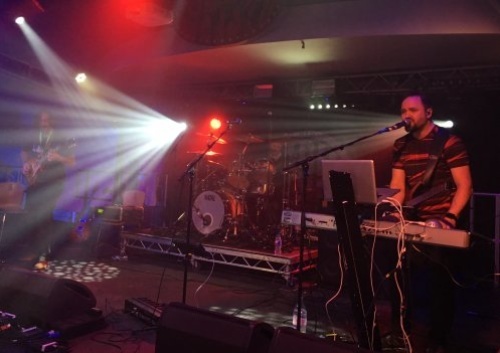 Mission Profile from Subsurface was particularly outstanding, and they played an excellent Lost in Translation from new album Legends of the Shires… which has nothing to do with Hobbits. 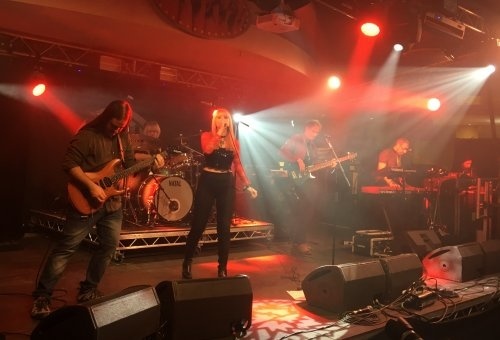 Saturday kicked off with a very polished set from this Welsh prog band, originally from the ’80s but more recently reformed with new members and a promising album in Crimson Stone. 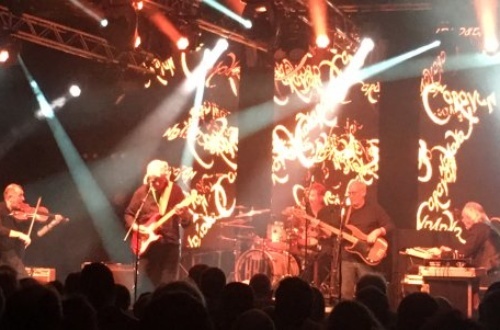 Contemporaries of the Neo-Prog bands of the early/mid-’80s, there are very clear echoes of early Marillion… with vocals reminiscent of Fish. Robert Wilsher is skilled on keyboards with that classic ’80s sound. The Wire from 1985’s East West was an impressive ‘proggy’ number. 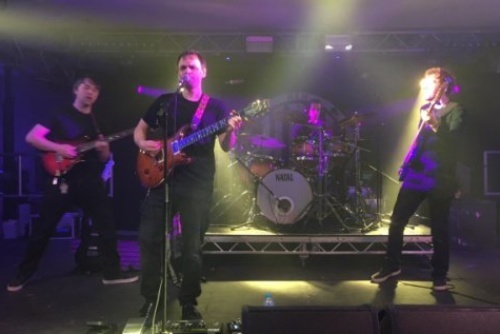 Younger member Aidan Neale showed notable touches of melodic guitar on A Headier Time to show that it’s not all about shredding, Aidan’s brother Jordan driving the band along powerfully on drums. 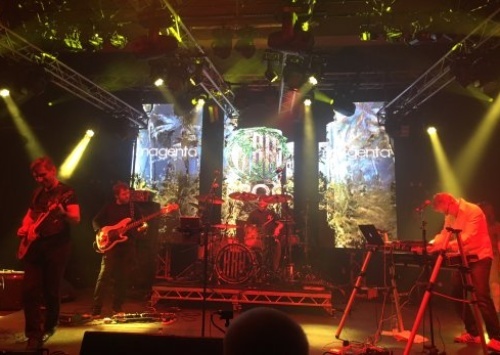 The growing early crowd clearly enjoyed this well played set with its roots in Neo-Prog… but the interesting thing to see is if this evidently talented but rather nostalgic band can develop from its past with more adventurous and fresher material… like Marillion did. Oh Dear, you can’t win them all, I suppose. I tried them for a couple of songs but they weren’t my cuppa to be honest… their Tolkien-esque name put me in mind of castles so I decided to visit the nearby ruins of Criccieth Castle instead – watching bands indoors for about 12 hours a day can leave one feeling rather ‘Vampiric’ and stir crazy so I like to get out to see the lovely local area at least once in the weekend, and there’s plenty to see. I later met a punter who liked The Tirith’s performance, which just goes to show that tastes can be so different. I must admit to missing at least half of this set with my little bit of castle exploration but I liked what I saw when I returned. The guitar work was particularly skilled and expressive. Himalaya Flash Mob is a great name for a song and sounded excellent. They got a good response from a slowly building crowd, final song Seamless Shirt including phrases from Scarborough Fair along with some impressive bass work. Not bad at all and promising for the future. 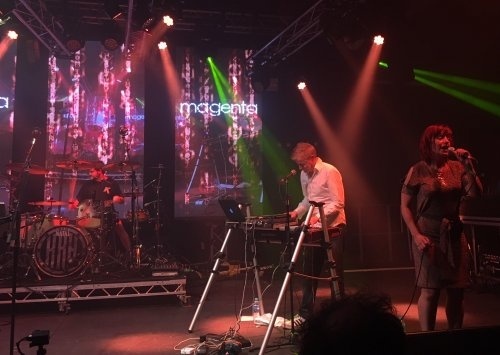 Those who knew Magenta weren’t surprised, but strangely there were many present who had not previously heard of them… but they’ll certainly remember them after a fabulous set of excellently played modern Progressive Rock in front of a large crowd in Arena One. 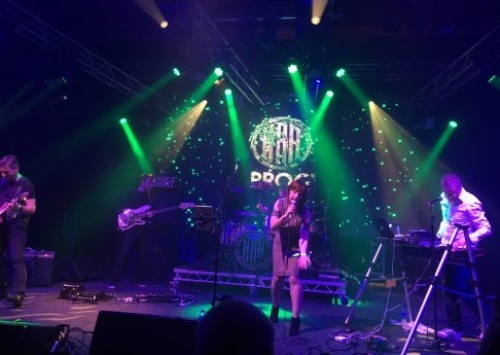 Sci-fi epic Trojan, from their most recent album We Are Legend, opens the show dramatically, albeit shortened for a festival set. 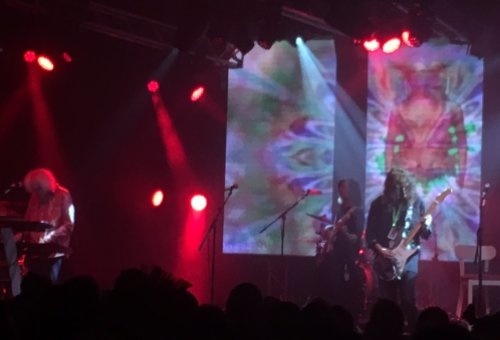 Speechless shows their more melodic side and also describes some of the crowd as they witness the guitar wizardry of Chris Fry, particularly on the Progtastic Magenta classic Gluttony, taken from the remarkable Seven album. 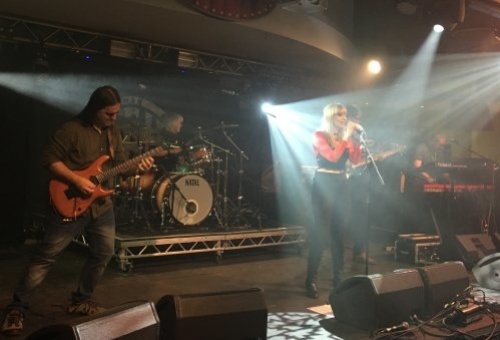 Pearl, from The Twenty Seven Club, based on Janis Joplin, is an opportunity for Christina Booth to show the quality of her beautiful voice, conveying the emotion of this tragic figure. Christina introduced Devil at the Crossroads, about Blues guitarist Robert Johnson, by claiming that Chris Fry sold his soul to the Devil. Performing with such consummate skill and charismatic showmanship (probably making him guitarist of the weekend for me), it’s easy to imagine such a bargain may actually have been struck! 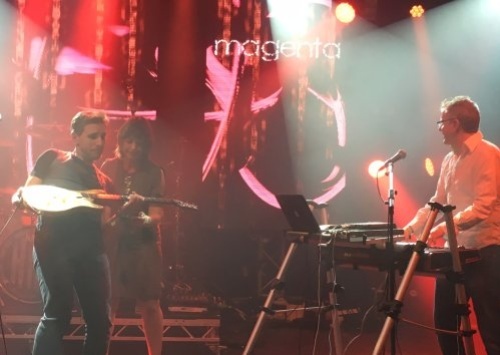 Vincent van Gogh inspired the swirling masterpiece that is Colours and Magenta paint spectacular musical pictures with main songwriter and keyboard maestro Rob Reed leading the band perfectly. 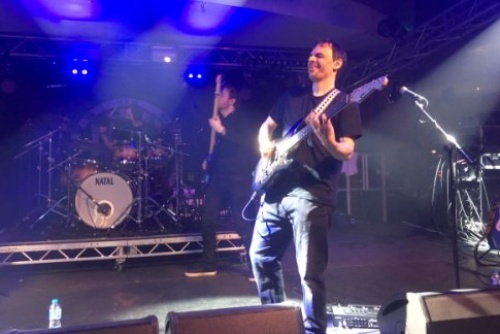 Jiffy Griffiths is a force of nature behind the drums, alongside Dan Nelson’s excellent bass. Demons and Metamorphosis show a darker side as they captivate the crowd with a majestic show. 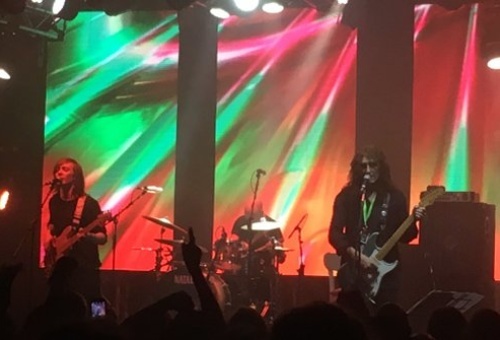 The reaction was ecstatic so they squeeze in a fun laden version of Pride, which is just how this magnificent band should feel after such an outstanding performance. 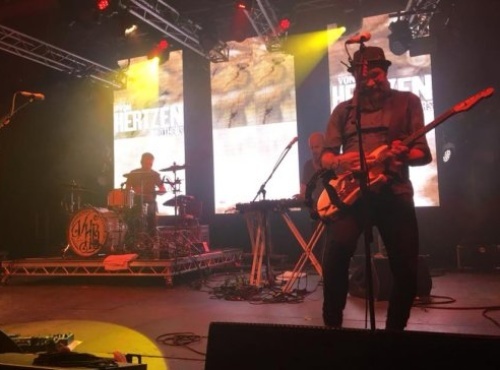 Simply one of the bands of the festival, a breath of fresh air to see a truly excellent but strangely comparatively lesser known band flourish in what could be described as the ‘Heritage Zone’ of Arena One, blowing away an unsuspecting crowd, and gaining many new fans. 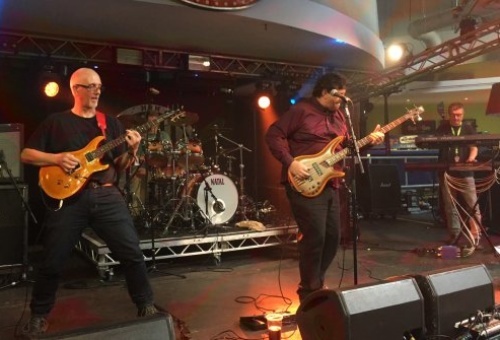 One of my ‘experiments’ of the weekend, about whom I knew nothing, but I witnessed an impressive performance from this talented three piece band. 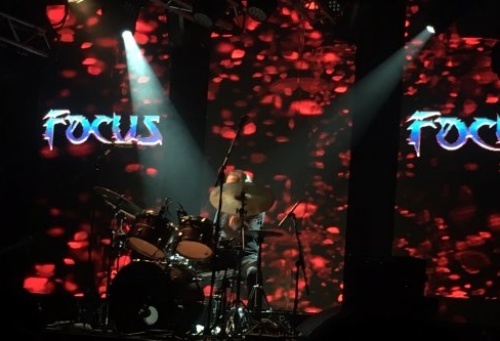 Playing at the same time as the legendary Focus in the main arena they still attracted a healthy crowd curious to see something new, and those punters were not disappointed. 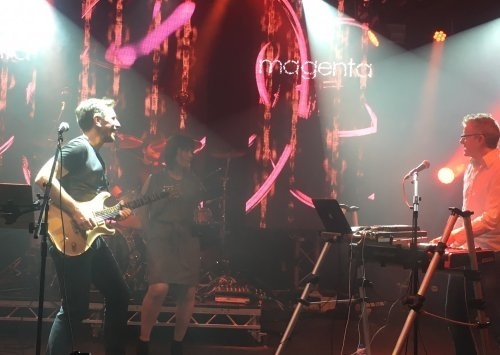 Playing songs from their new album Delta-V, Kepler Ten showed real promise with an assured performance of powerful and intricate progressive rock, with particularly strong vocals from James Durand. 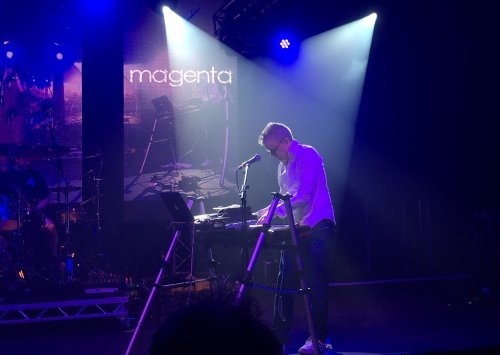 He showed great versatility with some dexterous bass playing AND keyboards. 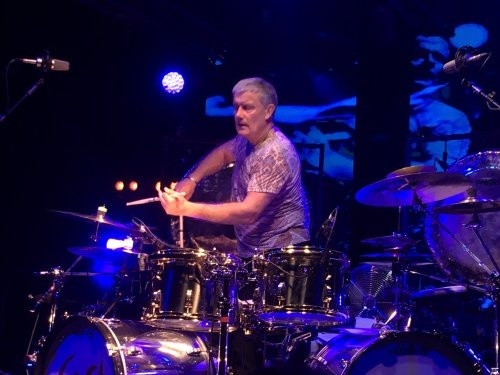 Steve Hales powered this tight outfit along on drums with power and touch, and Mike Tillitson’s excellent guitar work was flowing and exciting. 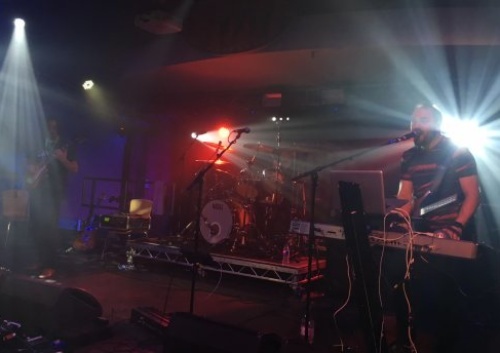 Swallowtail showed a much gentler, almost pastoral side, with lovely vocals from the impressive Durand, a brave song choice in a chatty festival setting… but it worked beautifully and showed they had confidence and the ability to pull off more delicate material in a live show. Their resemblance to another power trio – Rush – was inescapable and they showed their influence very clearly and skillfully with an outstanding cover of that band’s Subdivisions. 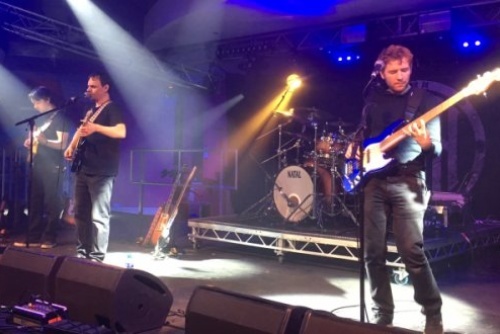 HOWEVER, please do not assume that this is a pale Rush copy band – their own material is distinctive and interesting. 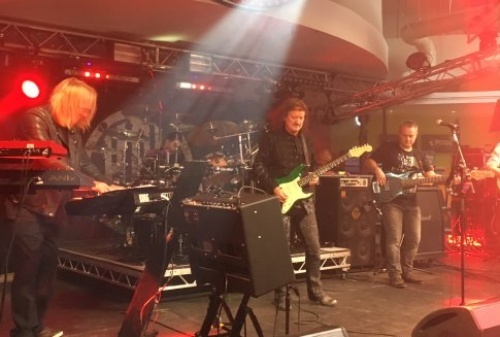 They honour their influence but do not slavishly ape them like so many other ‘Prog’ bands. 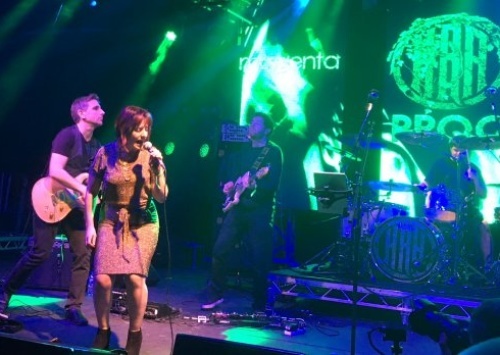 They concluded with an atmospheric, effects laden epic which pulled out all the stops and showed that Kepler Ten have the talent and potential to grow and grow. 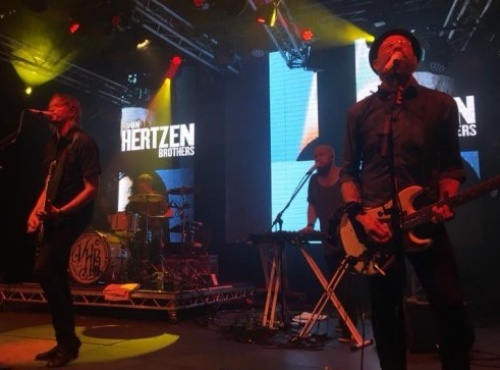 This band were an example of the festival giving a newer band a chance in front of a larger crowd, even if they had to compete with a ‘name band’…. now off to find Delta-V! 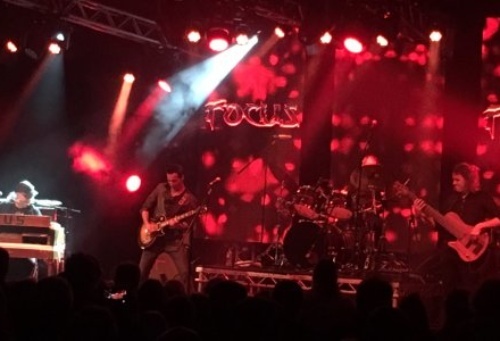 I was pleased to catch the final part of the Focus set with a tremendous version of Eruption and a drum solo, apparently their second of the set. 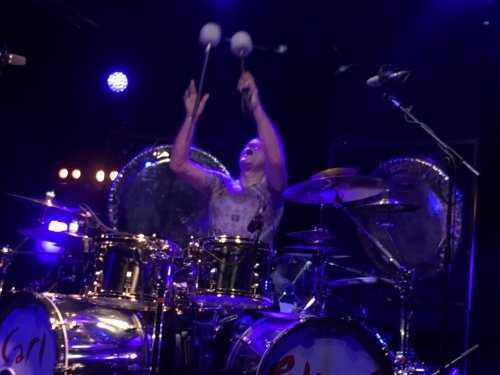 Two drum solos may be two too many in most shows, and one has to wonder at the balls of playing two such solos just before the master drummer of the following act is due on stage! 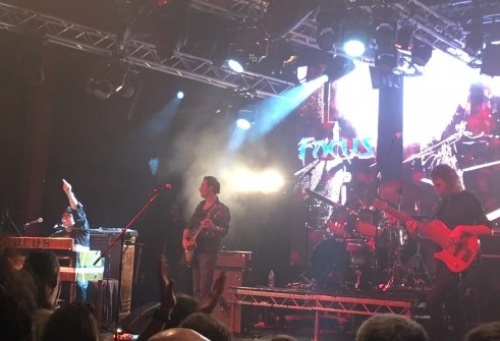 As usual they display great guitar work but the undoubted star of the show is Thiis Van Leer on keyboards (and trademark yodelling). His legendary and venerable organ is now almost literally held together by gaffer tape… but that’s probably an age thing. It was great to see them, but maybe give them a rest and let others have a chance in future? Blimey! 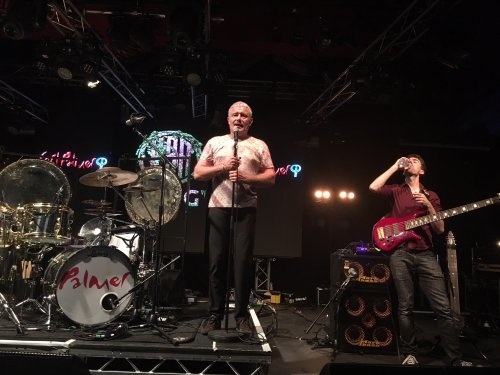 Carl Palmer, with mountainous drum kit to the fore, and his young band ripped into a muscular Peter Gunn and Hoedown, displaying great musicianship in a tribute to (but not a slavish copy) of Prog legends Emerson, Lake and Palmer. 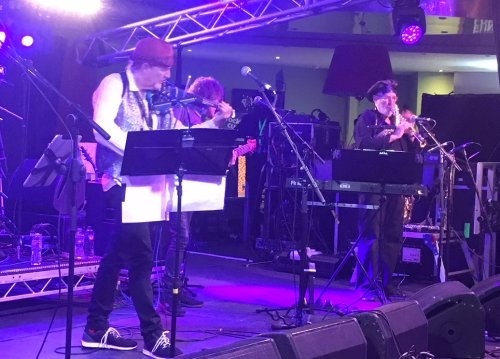 He touches on the sad loss of his band mates, Keith Emerson and Greg Lake, and tells the packed Arena One that the evening will be a tribute to the two of them. The Barbarian, from E.L.P.’s debut album, is breathtaking and perfect for this band format, with Paul Bielatowicz scintillating on guitar and Simon Fitzpatrick excellent on bass. 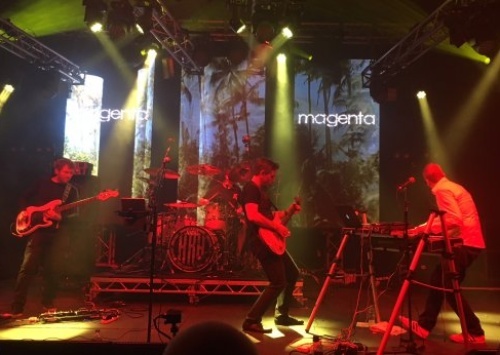 Trilogy in particular showed lovely interplay with delicate bass and guitar. 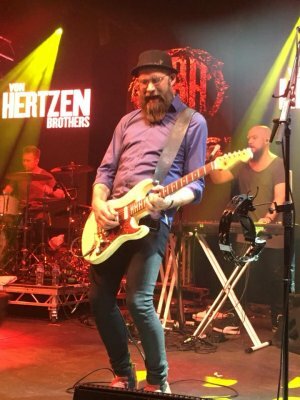 Fitzpatrick used a 6-string bass skilfully, almost acting as an extra guitar. 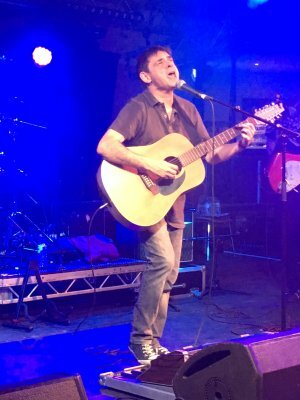 However, the undoubted star of the show is Palmer, who intersperses the songs with brief anecdotes about his earlier career, such as meeting Emerson when he was playing in The Nice… which is a good excuse to pound out a great version of America. A fine version of Knife Edge is followed by a powerful 21st Century Schizoid Man, originally sung by Lake on the debut King Crimson album. 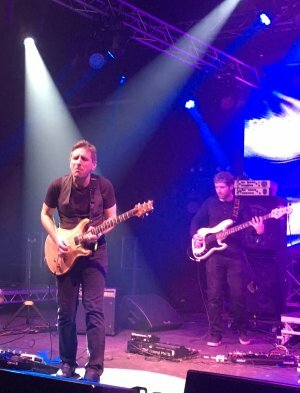 Bielatowicz is outstanding on guitar, even if his strangely gurning facial expressions leaves many in the crowd rather bemused! It was surprising to hear them attempt an instrumental version of the E.L.P. classic Lucky Man, as Palmer tells us Lake wrote this lovely song when he was 12 or 13! 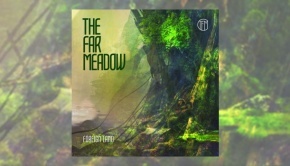 Fitzpatrick uses his Chapman Stick sounding like a synth for that familiar solo, and even if it lacks Lake’s wonderful vocals it’s a touching tribute. 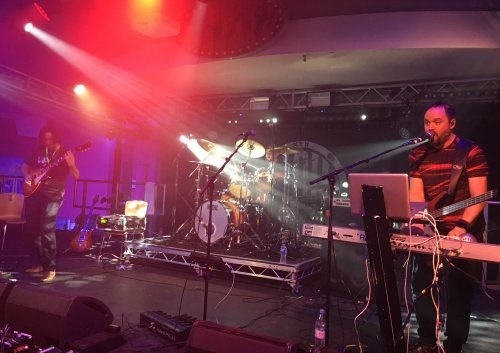 They finale with a titanic version of Fanfare for the Common Man featuring a spectacular and at times witty drum solo… exciting, imaginative and versatile… and even humorous as Carl ‘polishes’ a cymbal while playing it! Palmer is now 67 years old, but he is clearly as fit as a fiddle and he plays powerfully and skillfully all night. Nutrocker encores this marvellous set and leaves the crowd delighted. 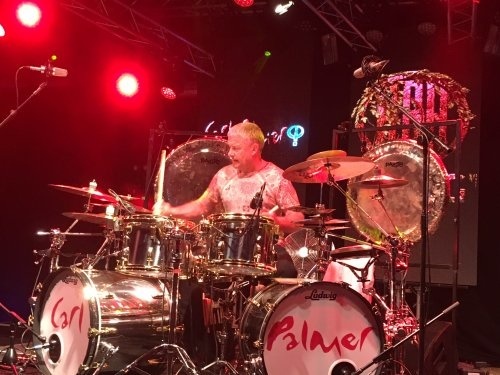 Carl Palmer is to be commended for touring with his own individual perspective, performing a different take on the material without keyboards, rather than performing merely as a pale and lame imitation of E.L.P. 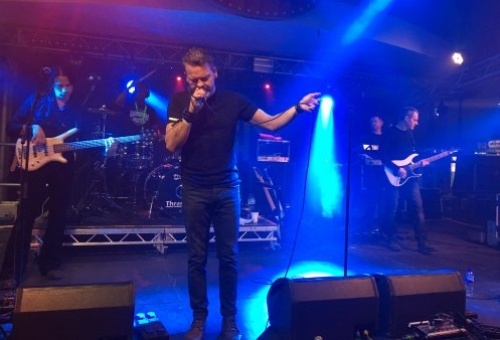 Keyboardist Rob Cottingham has formed this relatively new band after leaving Touchstone, and they kick off in Arena Two with a punchy Wiped Out from their promising debut album, Say. 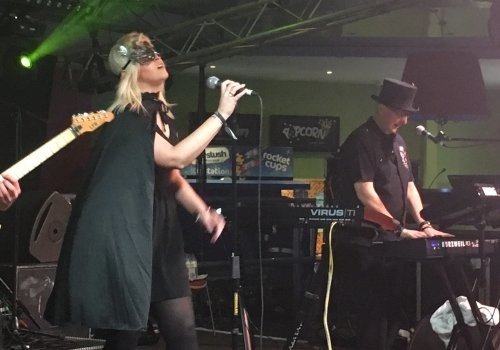 The striking Lisa Driscoll certainly commands a lot of attention in her black mask, stylish hat with blond hair, but in truth at times her voice does not quite match the power of the music. Nevertheless, she clearly has quality and potential. 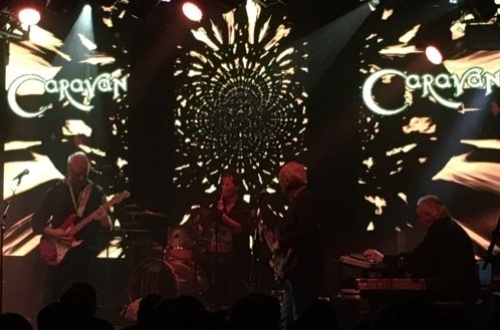 This is a band which specializes in smooth melodic and accessible progressive rock so it’s disappointing to see them beset with technical problems, such as tripping up in new song Tripwire which had to be re-started. Highlights of the set were the beautiful Gossamer Thread and the epic based on Hurricane Katrina, which really expands with power and scope in a live setting. 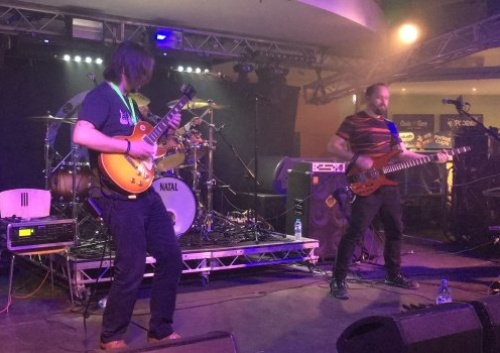 Nothing to Prove shows that they can really rock out, but in all honesty they clearly have much to prove as their set was one of the most technically flawed shows of the whole weekend, leaving Cottingham to ironically thank ‘Brian’ the computer for messing up the show. 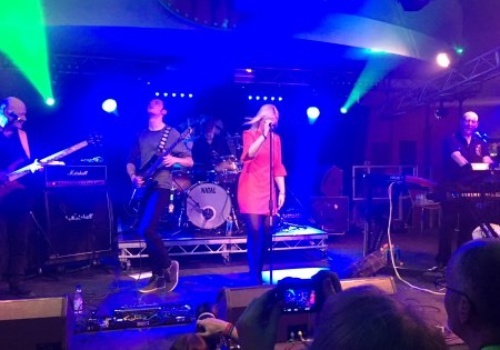 Having seen them perform well elsewhere I know this was not typical, but it was unfortunate for one of the newer bands on a larger stage in front of curious punters – a lost opportunity for sure. 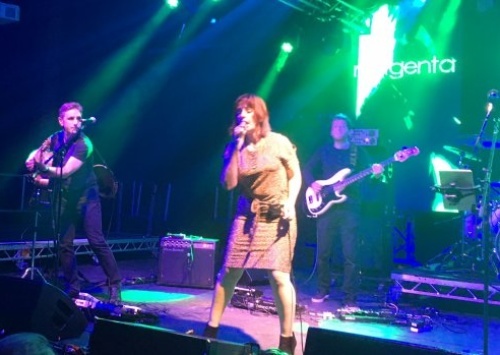 It falls to the ex-Pallas singer to close out proceedings for the whole weekend with a very late set on Stage Two. 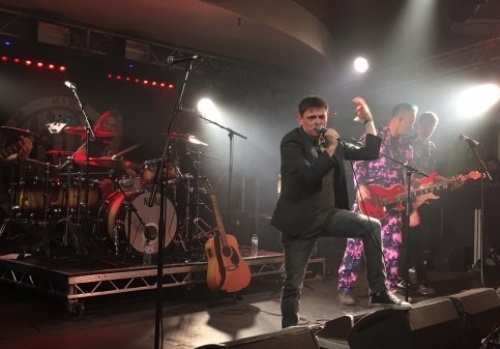 In an excellent and charismatic show, they commence with the folk tinged Begin Again from Alan’s great debut solo album First in a Field of One, which brims with energy… but nothing can outshine the absolutely remarkable psychedelic suit worn by guitarist (and ex-Twelfth Night singer) Mark Spencer. 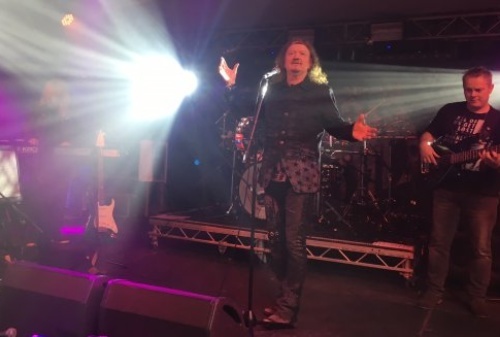 Reed introduces the excellent For the Greater Glory as originally by “a certain Aberdonian Band”, revealing that feelings about his departure from Pallas may still be a little raw. 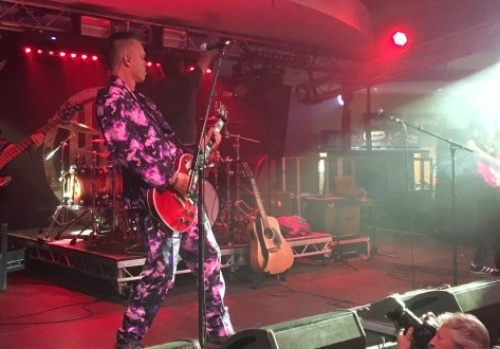 Nevertheless, it is his own excellent material, largely drawn from the new album Honey on The Razors Edge which makes the most impact on the audience, such as the translucent My Sunlit Room, commencing with classical guitar before really rocking out. A song about the Holocaust, Sanctuary shows that Reed thinks deeply and emotionally about his work, this song really standing out. 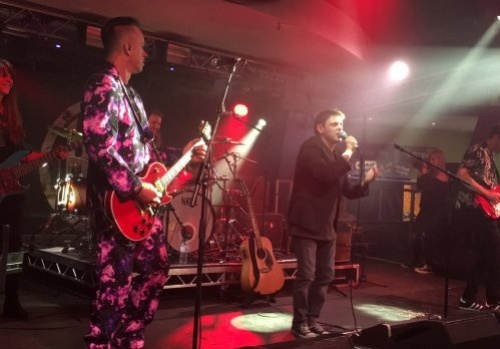 Kingdom of the Blind is anthemic before Reed tells us that his ‘day job’ is with BBC News, leading him to witness some rather unpleasant characters such as Max Clifford, which inspired Cross My Palm. The eco-disaster song Never Too Late starts to show that Reed’s voice at this late hour is struggling a little with the higher notes, but he gamely continues and manages his vocal demons. Jennifer Clark is particularly impressive on bass as the band play the rather bitter Used to be Someone. Failed relationships seem to feature a lot in Reed’s lyrics, such as the powerfully evocative The Other Side of Morning, but despite often rather sombre material, Reed and his band are clearly having a great time and his infectious stage presence holds on to and draws in a growing crowd, including some late ‘refugees’ from the next door ‘Heritage Dome’ in Arena One after Magnum finish. 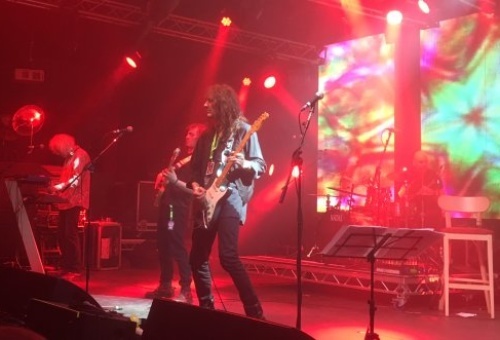 The main set finishes with the very old and remarkable Pallas song Crown of Thorns, given a special twist by the talented ‘Daughters of Expediency’ band with Daren Callow on guitar and the versatile Henry Rogers on drums. 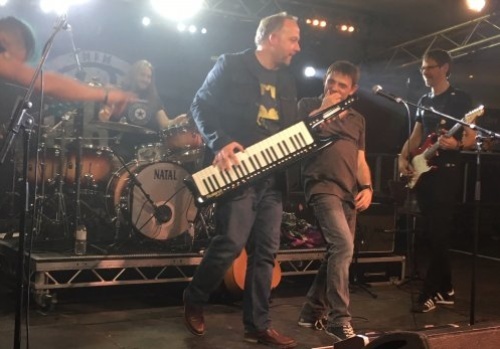 Tudor Davies even emerges from his banks of keyboards briefly to show off his cheesy Keytar, but one suspects he’s far from comfortable front of stage! 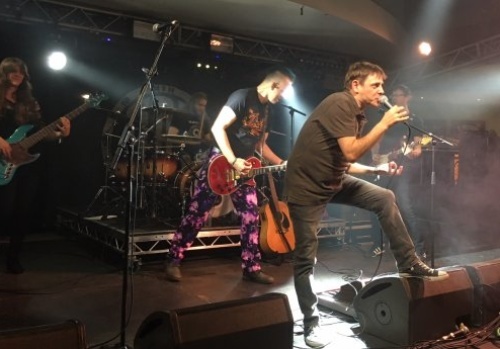 The undoubted star of the show is Alan Reed, even in the shadow of the enormous height and talent of Mark Spencer, and he shines as frontman, even if his voice is more or less shot by the end of the evening – a sign that he puts SO much in to his performances. It’s great to see this artist flourishing in a live setting, and it’s a fitting and high quality way to conclude this whole festival. Of course, for such a comparatively large event pulling big crowds, they won’t be able to keep everyone happy all the time. 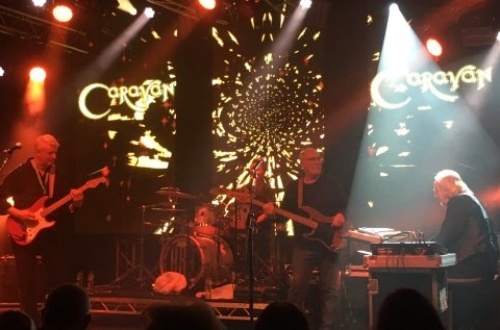 One piece of feedback would be to try to vary the roster of bands rather more as some bands seem to come back every other year (such as Caravan, Mostly Autumn and Focus, amongst others). At least we were spared yet another appearance by The Enid (whom had played for the previous FIVE festivals I believe! ), but I even heard someone complaining that they weren’t playing this year! 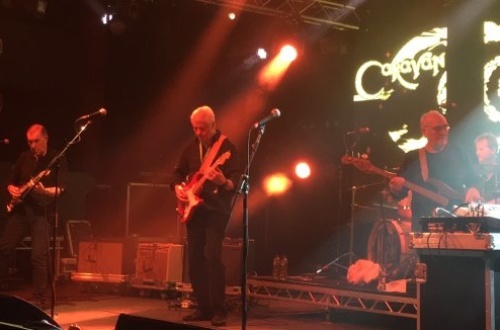 I have no problem with The Enid, or any of the bands appearing, but would like to suggest NOT every year or every other year – one can begin to get a sense of Déjà vu after a while. 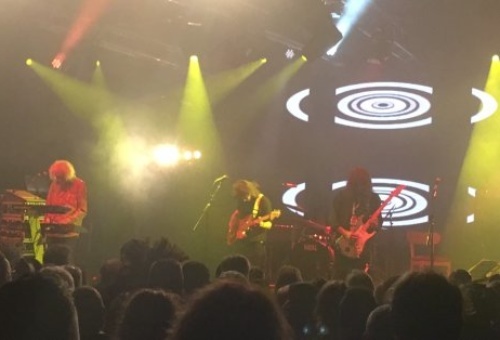 Some punters would prefer the festival to be a little more adventurous in the main arena with lesser known or younger progressive rock bands – and to be fair last year Verbal Delirium and Panic Room emulated Magenta in making a great impact in that larger arena. 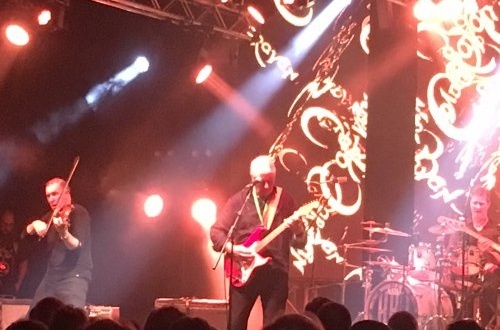 However, therein lies the quandary for HRH Prog – if they booked a lot more younger or lesser known bands then sadly it is inevitable that they would not sell such a large number of tickets, as other promoters can testify. 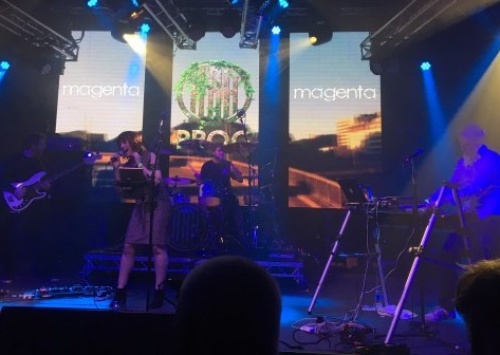 The ‘Prog’ audience is notoriously conservative in their tastes (ironically when considering the meaning of the word ‘Progressive’) and the great majority seek familiar ‘name’ bands from their younger days on the whole. 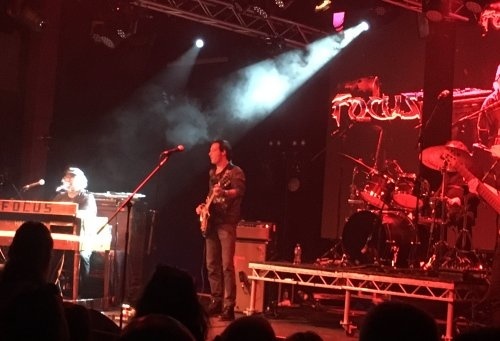 Credit must be due then to HRH Prog for using the attraction of well known ‘heritage’ acts which draw larger crowds as an opportunity for lesser known artists to showcase their undoubted talents on larger stages in front of crowds rarely seen at other Prog venues in the U.K.. 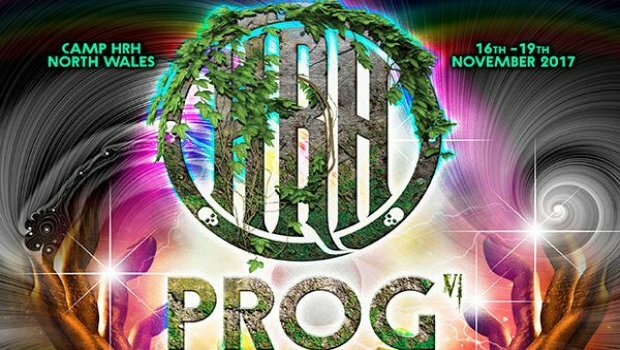 I look forward to HRH Prog 7 in November 2018… and could I suggest they try to book some great newer bands (such as the stellar Franck Carducci Band or the wonderful Tiger Moth Tales) that have never appeared at this festival. Such artists deserve the chance to play alongside some of the greats of previous decades. 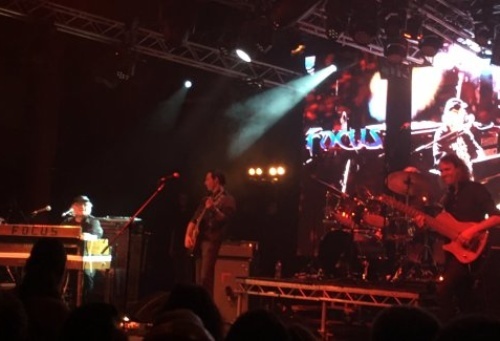 Thanks HRH Prog – it was a great weekend. P.S. – Could you also try to move this lovely corner of North Wales a bit closer to the rest of the planet!